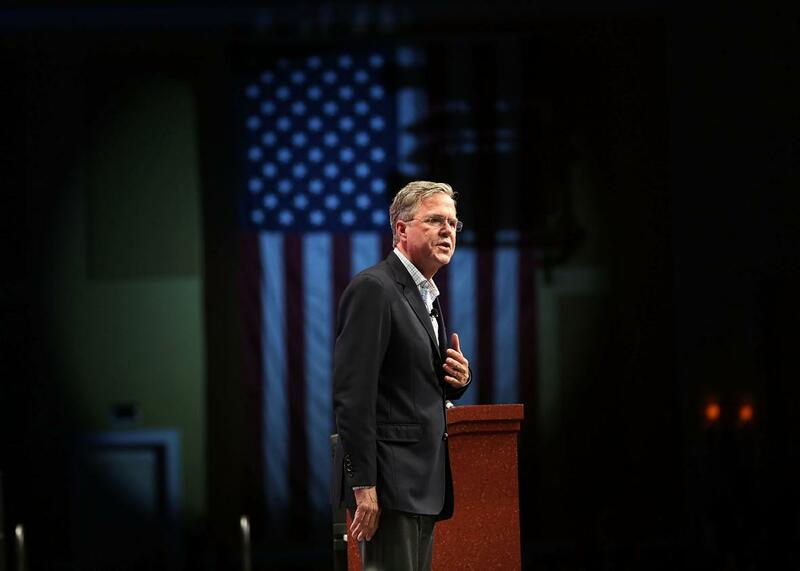 Jeb Bush, Marco Rubio follow far right views on Syrian refugees. Jeb Bush speaks during the Sunshine Summit conference on Nov. 13, 2015, in Orlando, Florida. Jeb Bush and his fellow establishment candidates are hoping against hope that last week’s terrorist attacks in Paris will make Republican voters reconsider their allegiances to nontraditional candidates. The tragedy, their thinking goes, will finally give them a chance to tout their experience and relative sanity in a race that has so far been dominated by political outsiders who have campaigned largely in the land of fantasy. On Monday, I explained why I don’t think that logic holds: There’s evidence to suggest Donald Trump and (to a lesser extent) Ben Carson actually enter this particular debate about national security with an advantage, and there’s little reason to believe that will change in the short term. But there’s another reason to doubt that Republican voters will run en masse toward a moderate GOP candidate in the wake of Paris: There isn’t one. It’s early, but to date the field of GOP contenders has moved largely in unison, particularly on what has become the most pressing issue: whether the U.S. government should close its borders to Syrian refugees who are fleeing horrific violence at home. Trump and Ted Cruz lead the way in the fearmongering—the former has been rambling on about an ISIS “Trojan Horse” for months; the latter is introducing refugee-banning legislation in the Senate this week—but the establishment candidates are mostly marching in lockstep with their party’s hardliners. Marco Rubio, the best positioned candidate in the establishment wing, made his position clear on Sunday. “You can have 1,000 people come in, and 999 of them are just poor people fleeing oppression and violence, but one of them is an ISIS fighter,” he said during an interview on ABC’s This Week. “If that’s the case, you have a problem, and there is no way to vet that out.” Bush, meanwhile, staked out a similar position—albeit with a Cruz-endorsed caveat that we should try to find room for Christians. Chris Christie also got in on the tough talk, suggesting that he was so serious about closing our borders that he wouldn’t even make an exception for Syrian orphans under age 5. Meanwhile, John “What Will We Tell St. Peter?” Kasich has dropped his support for taking refugees. And even Lindsey Graham—perhaps the most pro-refugee candidate in the GOP field—now wants to call “timeout” on the whole thing. First things first: This is a shortsighted policy proposal that isn’t just morally misguided; it’s dangerous. As Slate’s Joshua Keating points out, the Islamic State is doing everything it can to get young, nihilistic recruits to move to Syria, not fan out across the globe. Closing our borders to refugees would only provide ISIS with a bigger pool of frustrated, marginalized young Muslims to try to radicalize. Furthermore, there’s no reason to mistake Syrian refugees for ISIS terrorists. As another of my colleagues, Will Dobson, explains, there may be no more difficult way for a would-be terrorist to enter the United States right now than to pose as a Syrian refugee. Beyond policy, this is also bad politics for anyone in the establishment wing who’s hoping to prove that nuance and knowledge should eclipse bluster and belligerence in the nominating race. In that regard, Rubio’s position, while disappointing, makes some sense: He’s currently finding some success by keeping one foot in the outsiders’ lane while keeping his other in the establishment one. The last thing he wants to do now is look “moderate.” Christie’s not-even-orphans stance, meanwhile, is more politically questionable—though perhaps also predictable given he failed a similar leadership test during last year’s Ebola scare. It’s Kasich’s and Bush’s newfound positions, though, that prove there are no actual moderates in the GOP field on this topic. “I wouldn’t say to these people, ‘You can’t come in,’ ” Kasich told Fox News back in September. “I mean, we’ve got the Statue of Liberty that says ‘Give us your tired, your poor.’ ” He changed his tune this week, writing to President Obama asking him to pull the plug on the resettling effort. Conservative apostasy was always going to be a tough sell in a GOP race, but it’s all Kasich has at this point. It’s too late for the Ohio governor to rebrand. Bush continued: “The answer is to lead, to resolve the problem in Syria. That’s the ultimate answer. And that’s my focus.” Ironically then, Jeb is making the same policy-light pitch to voters that Trump is: I will lead because I am a leader. The problem for Bush, though, is that to date there’s little to suggest that conservative voters believe that he is.